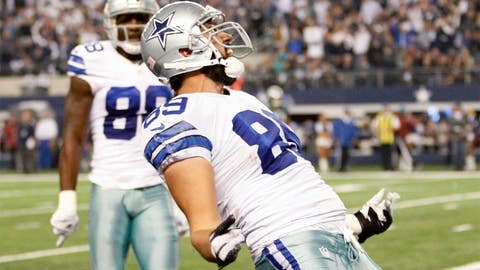 Dallas Cowboys tight end Gavin Escobar (89) celebrates his touch down in the end zone. When you have a draft like the Dallas Cowboys did in 2009, the fan base is going to be skeptical of your scouting department. That year, Dallas selected 12 players. None of them were on the roster during the 2013 season. However, looking at the Cowboys’ most recent draft, there is plenty to feel good about. Dallas drafted seven players in 2013 and four could be in the starting lineup next season. Here’s a look at how all seven performed in their first NFL season. Travis Frederick. Pick: First round (31st overall). Selecting a center didn’t exactly pump excitement into the Cowboys fan base when he was selected, but Frederick turned out to be an outstanding pick. Starting all 16 games, Frederick helped turn the Cowboys’ offensive line from a weakness to one of the team’s biggest strengths. Gavin Escobar. Pick: Second round (47th overall). Using a second-round pick on Escobar set the bar way too high for his rookie season. His receiving skills are exceptional but the tight end lacked the ideal size to be an effective blocker in Year One. If Escobar can bulk up in the off-season, he’ll get more opportunities to be on the field, which will lead to more chances to use his athleticism to score touchdowns like he did in the season finale. Terrance Williams. Pick: Third round (74th overall). The former Baylor standout wide receiver had a solid rookie season. Williams had his ups and downs but ultimately showed that he should team nicely with Dez Bryant to form a very good receiving duo. Williams played in all 16 games, catching 44 passes for 736 yards and five touchdowns. J.J. Wilcox. Pick: Third round (80th overall). Wilcox looks to be a solid building block at the safety position. He became a starter in Week 3 and remained there for five weeks before spraining his knee. The hard-hitting 22-year-old should be in the starting lineup in Week One next season. B.W. Webb. Pick: Fourth round (114th overall). Webb had a disappointing rookie season. He played in 15 games, recording one pass defensed and 13 tackles. Webb never seemed comfortable at his cornerback position. He was given several opportunities to play and was benched multiple times after allowing big plays. Like most players in the Cowboys’ secondary, Webb needs to play better in 2014. Joseph Randle. Pick: Fifth round (131st overall). He was the top choice to step into the starting lineup when DeMarco Murray was injured midway through the season. Randle started two games but struggled to average more than three yards per carry. He didn’t make a huge impact, but he should continue to be a decent option out of the backfield if Murray cannot stay healthy. DeVonte Holloman. Pick: Sixth round (185th overall). He was about as good of a sixth-round pick as you could hope for. As an outside linebacker, Holloman fits nicely into the Tampa-2 system with his coverage ability and athleticism. In the season finale, Holloman led the Cowboys with 11 tackles and two sacks. His future is bright.